My journey to Judaism has been complicated, and Jewish motherhood has thrown me my fair share of challenges as well. When I shoo (and occasionally shove) my kids out the door for Hebrew and Sunday school amidst a chorus of protests, I feel a level of hypocrisy because I never went to either of these things myself. The closest I came to any formal Jewish education was age 12 when my parents asked me if I was interested in being bat mitzvahed. When I inquired what that would entail, and the word “school” was uttered, I said whatever version of “hell no!” was acceptable at the time. I hated school and anything that slightly stunk of it. (Even school cloaked in a tallit, shmear and a dance party.) My parents didn’t push it. I think they understood that because we had no affiliation with a synagogue, a JCC or even that many Jewish folks, my sudden interest in a Bat Mitzvah was a longshot. Even having my last name called out in class – Moses – caused me to squirm; nothing like being an unaffiliated Jew who also shares a name with one of our greatest leaders. As I became a full-fledged teenager, I found myself much more comfortable within the folds of the African-American community than with anything or anyone Jewish. My first serious boyfriend was African-American. We dated for four and a half years and I saw myself marrying him. This wasn’t uncommon where I grew up, so my community and my parents were very accepting. However, when I went to college, it suddenly became very important to them that I not be the token Jew. I was looking at very small liberal arts colleges, so the chances of being the only Jewish person there was plausible. I ended up at a college of 500 and out of the 500 students, there were only four of us, so 0.8% Jewish. I wasn’t the token, but pretty close. One of the Jewish boys stood out to me. He made references to being Jewish on a daily basis; he used Yiddish words for punch lines and emphasis; he went to High Holiday services and drank pickle juice. He also listened to rap music and had a general affinity for black culture. And so, we bonded. He got me thinking about being Jewish in a different kind of way. More honestly, he got me thinking about Judaism in the first place. In the meantime, my boyfriend joined the military. When he sent pictures I noticed there were no white soldiers around him, and when he came home on leave I noticed he’d added quite a few Malcolm X T-shirts to his wardrobe. We broke up my senior year, and he told me he’d never date a white girl again. Stung as I was by his statement, in time I recognized that he had found a sense of belonging to his culture while I was still a stranger to mine. So, what to do after five years of college and a degree in psychology? Tell your parents you want to be a bartender in Boston of course! (“Where everybody knows your naaaaame…”)That decision went over like a lead balloon. Not only because they knew my favorite drink in college was Purple Passion in two-liter form, but also because they had a super-secret alternative plan for me – ISRAEL. The catch was, (if I took the bait), I had to go for a year. Feeling like I had nothing to lose, I agreed. I never expected for that trip to entirely change the course of my life, my identity and influence so many of my choices thereafter, but it did. And as dramatic as it sounds, I truly, wholeheartedly, believe going to Israel saved me from being lost in life. The first Shabbat I celebrated in Israel cemented for me that I too wanted a cultural belonging. For the first time, Judaism resonated with me. The rest of the year in Israel affirmed my connection, and I returned home belonging to something bigger than myself. 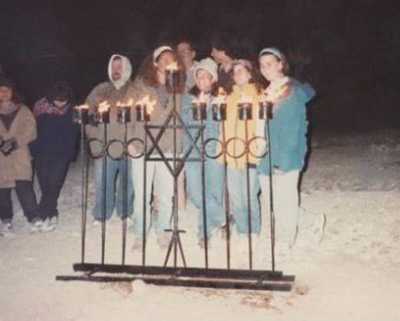 Annice (far right) and friends in the Arava Desert in Israel circa Chanukah 1993. A year later, back in Chicago and working for Hadassah, I met a wonderful and kind Jewish man (just like Bubbe always wanted.) We were married two years later in his family’s synagogue and went on to have three sons, all of whom got the official Jewish snip-snip in that same synagogue. And, we adopted our daughter, who received her Hebrew name there too. Sounds great right? “Unaffiliated Jewish girl becomes a massive devotee after Israel visit.” Well, kinda. As I mentioned, it’s been a complicated journey. Because I wasn’t raised with any kind of formalized Judaism, I struggle in a formal setting. I dress the part, but I have to look to others for the cues to bow and stand. I can’t read Hebrew either, and there have been moments during responsive readings when I’ve remained close-mouthed because I don’t agree or understand the portion. At the same time, when the Mourner’s Kaddish is recited, I do feel a genuine sense of collective community love and support for the bereft. When I look around at the hundreds of people –hundreds of Jewish people – gathered together to reflect, repent and begin anew during the High Holy Days, I feel a part of something. I think of the sacrifices, the history and the losses of my people. There’s also a sense of sadness for all the years I wasn’t a part of things. The years I spent not knowing that Judaism was a part of me. I swore to myself that I would raise my kids with a sense of belonging and I do believe my kids feel grounded in a Jewish cultural identity. They know they are Jewish first and foremost. Sometimes they ask us to look up all the Jewish fill-in-the-blanks so they can brag to their friends about how “officially” cool Jewish people are. If they hear a Jewish sounding name they ask us to verify. They love a good Shiva spread. They carry the last name “Moses-Rosenthal” and none of them mumble or bow their heads in shame when they need to say it, spell it or own it. There is tremendous pride in that for me. And within that pride, lives my new beginning.